We offer free pickup and delivery of vehicles (in town) and courtesy cars for customer convenience. We have 3 Ford Taurus's as courtesy cars. They are at no charge other than they need to be returned full of fuel. 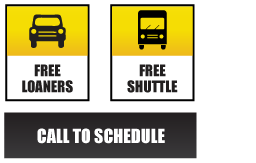 We shuttle customers and their vehicles daily also.